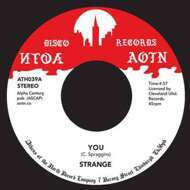 Two previously unreleased tracks from the outsider disco outfit - Strange! Christopher Spraggins & The Strange Band out of Rochester, N.Y released a total of one record. . A spaced out druggy disco band that had a hint of Rick James with a deeper trippier vibe that's truly unique, reproduced for you here for the first time since 1978. The band was introduced to the world by Cleveland Unlimited Records who still exist to this day, unfortunately as these things go, the record failed to gain sales needed to justify further but a whole LP was recorded, here we bring you the best tracks from that unreleased LP on your favourite format.